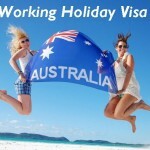 Australia working holiday visas allows working holiday makers to have an extended holiday in Australia by supplementing their travel funds through incidental employment. A working holiday visa for Australia allows you to stay in Australia for up to 12 months, however it’s important to note that your aim must be to holiday in Australia with work being purely incidental to provide funds for traveling. You can work but no more than 6 months with one employer unless you have a written permission from the department of immigration. The working holiday subclass 417 visa is for young people aged 18 to 30 who are interested in a working holiday in Australia. This visa can be extended for another 12 months and you can supplement the cost of your holiday through short-term employment. The subclass 417 visa is available to passport holders from Belgium, Canada, the Republic of Cyprus, Denmark, Estonia, Finland, France, Germany, Hong Kong SAR, the Republic of Ireland, Italy, Japan, the Republic of Korea, Malta, the Netherlands, Norway, Sweden, Taiwan and the United Kingdom. The work and holiday subclass 462 visa is for young people aged between 18 and 30 from Argentina, Bangladesh, Chile, Indonesia, Malaysia, Thailand, Turkey, the USA and Uruguay. Citizens of Iran who are currently in Australia on a Work and Holiday visa may also be eligible to apply for further Work and Holiday visas. This visa is designed to encourage cultural exchange and closer ties between these countries and Australia. Applicants must meet specified requirements regarding their English language and education level, in addition to evidence of sufficient funds and health and character requirements. There are a number of basic requirements which you need to fulfill to be eligible for either of the working holiday Visa. Applicants who have performed specified work in an eligible regional Australian area for a minimum of three months (88 days) while on their first Working Holiday visa may be eligible for a second Working Holiday visa. The requirements are the same as for the first visa, however applications can be made while the applicant is located either in or outside Australia. Applicants must have evidence of their specified work. What does the Australian Working Visa allow you to do? if applying outside Australia, travel to Australia at any time in the 12 months from the date the visa is granted (this cannot be extended or deferred. Working Holiday visa holders are permitted to do any kind of work while in Australia, for up to six months with each employer. There are various ways to find work in Australia including the employment pages in newspapers, the Internet and job placement service providers (charges for this service may sometimes apply). Popping into shops and asking if they are seeking temporary staff can also be a good way to secure positions. If you intend to work in your occupation in Australia, you should be aware that registration or licensing may be required. This applies particularly to the health professions and the construction sector. You should contact the relevant assessing body to ascertain if you need to obtain registration or licensing in Australia. Certain occupations may also require workers to undertake health and character checks as well as registration, such as jobs that involve working with children. Remember that the Australian Government has strict laws regarding employment of non-citizens and penalties for breaking the law. Don’t try and work without the right visa. If your Working Holiday visa expires and you have not left Australia or applied for another visa, you could risk being detained and possibly removed. You may also not be allowed to return to Australia for a period of time. There are other visa options if you wish to stay temporarily or permanently in Australia at the end of your working holiday.